Most car accidents, whether they involve two or more vehicles, a vehicle and a pedestrian, or a vehicle and a cyclist can usually be attributed to human error, which could include everything from falling asleep at the wheel or violating a traffic law to driving while intoxicated. However, a surprising number of car accidents actually involve only a single vehicle and are the result of collisions with road hazards. Although it may seem like these types of accidents would have less serious consequences, the reality is that road hazards can prove just as dangerous to drivers and cyclists as a negligent motorist. Although it is often more difficult to file a personal injury claim in these types of cases, it is not impossible, especially for those who have legal representation, so if you were injured in an accident after encountering a road hazard, please contact our car accident legal team today for a free case evaluation. 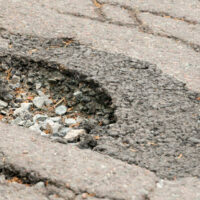 What Qualifies as a Hazardous Roadway Condition? Despite the efforts of maintenance crews and construction companies, hazardous and defective roadway conditions do exist in Florida, not only on highways and surface streets, but also in parking garages, parking lots, and construction zones. Conditions that qualify as hazardous include everything from uneven pavement and potholes to grooved asphalt and missing signage. In fact, some of the worst road hazard-related car accidents involve actual physical objects on the road, such as trash, fallen trees, blown out tires, and cargo that has fallen out of trucks. It is often difficult to determine who is at fault in these types of cases, especially when it is not immediately evident who was responsible for the hazard in the first place. However, it’s important to note that cities, states, local agencies, and maintenance crews have an obligation to keep the roadways clear and free of hazards, so if a person is injured in an accident because he or she struck a pothole, collided with an object blocking the road, or lost control due to the presence of gravel or uneven pavement, he or she could be eligible to recover damages. Unfortunately, holding government agencies accountable for their negligence can be difficult and requires plaintiffs to comply with a series of strict notice requirements. These hurdles are not insurmountable, especially for those who are represented by an experienced attorney who is well-versed in state law and can ensure that these requirements are fulfilled. Alternatively, the particular person responsible for the hazard could be held accountable for resulting injuries, if the parties’ insurance policies do not cover the damage. If, for instance, a truck driver failed to secure cargo that he or she was transporting and the items became loose and fell into the roadway, causing an accident, that individual and his or her employer could be forced to compensate any victims for their injuries. If you were injured in an accident resulting from a road hazard or defect, please call Boone & Davis in Fort Lauderdale at 954-566-9919 to speak with an experienced attorney about your legal options.